We began the day by taking the bus to a small rural town called Kallmunz. It was about a 30 minute ride from Regensburg. This was a pretty little town; very quiet and quaint. On the cliff backdropping the town are the Kallmunz castle ruins. These date from the 11th century, I believe. We hiked up the cliff and ate lunch amongst the ruins. 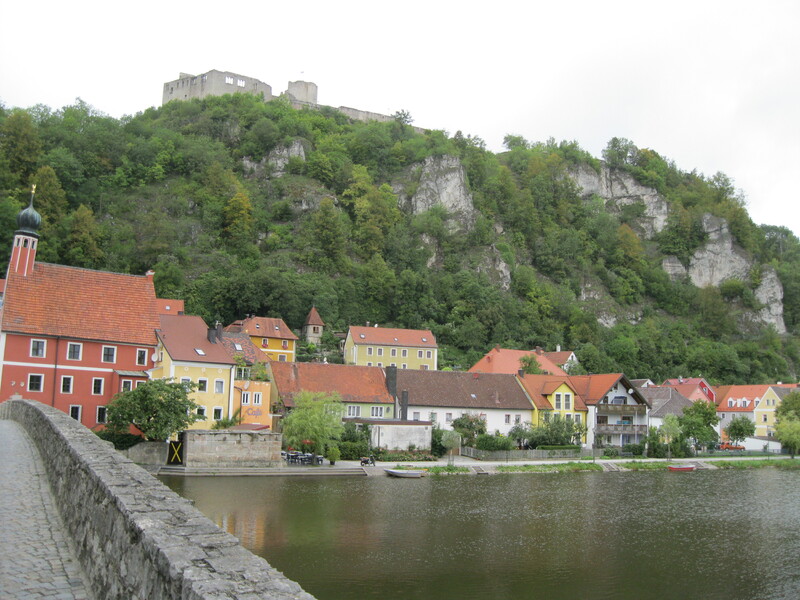 The town of Kallmuz sandwiched between the castle hill and the Vils River. The bulk of the ruins. There is a tower to the left, out of the picture. The man on the left is our director, "Coach" Orr, and next to him is Johannes, a local German who was our canoe flotilla admiral. After lunch we hiked down the other side of the hill/cliff into the “suburban” area of the town. The trail wound down through luscious pastures, gardens, and small homes. It felt a lot like I imagine Hobbiton would. Anyhow, we rendezvoused with the canoe rental people, who loaded us up with gear. We proceeded to canoe eight miles down the Vils River, which turned into the Naab River somewhere along the way. 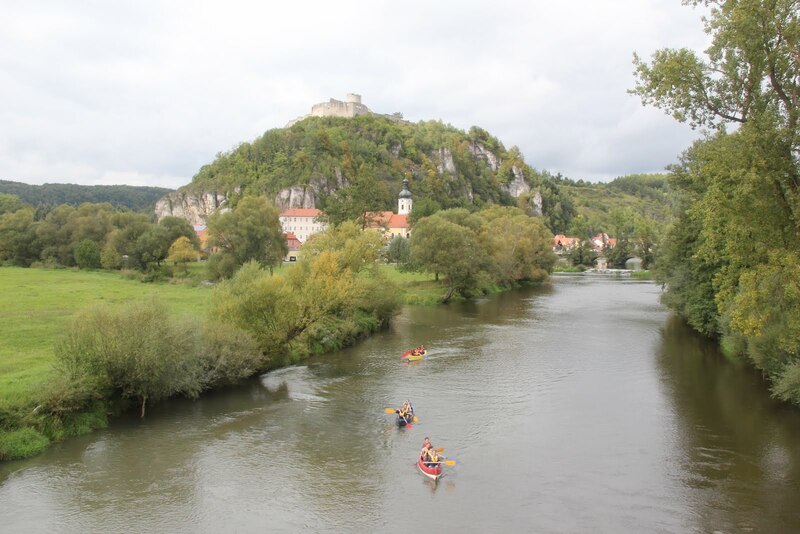 Had we unlimited time, we could’ve canoed into Regensburg, I think, but as it was, we pulled out in Pielenhofen, home of the Regensburg boychoir. They have a nice school/dormitory attached to the local cathedral. Another beautiful building, but no more pictures of cathedrals for a while! After returning the canoes to the owners, we piled on the city bus and went home for dinner. That was a full day! Tune in tomorrow to hear about Sunday’s adventures. Canoe Echo and it's crew (since we were the fifth canoe in the water). Don't get excited about the gender ratio of the crew members; they required one man per canoe. 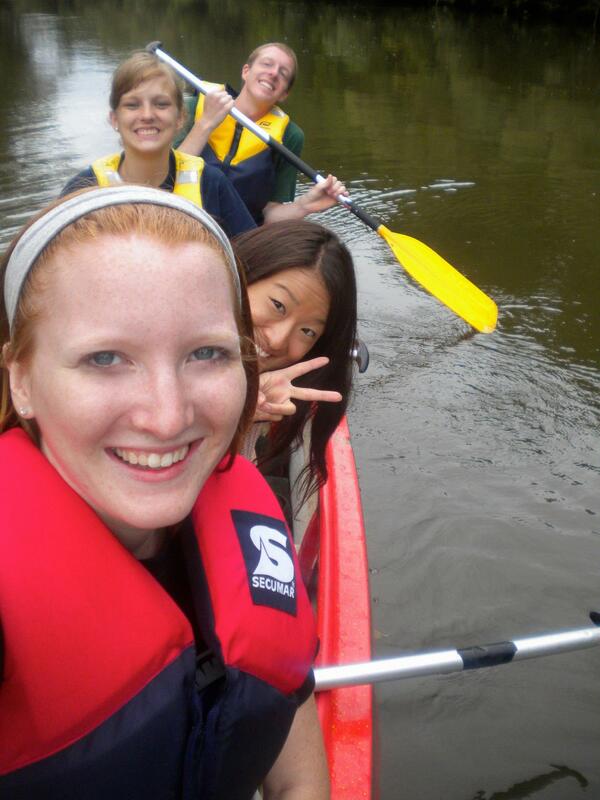 Also, I realize that in this picture I am holding the paddle incorrectly. I DO know how to paddle the right way, rest assured. Three of the five canoes on the water, tails to Kallmunz and the castle ruins.